The crystals, oh the crystals (which were so worth the labor of love). 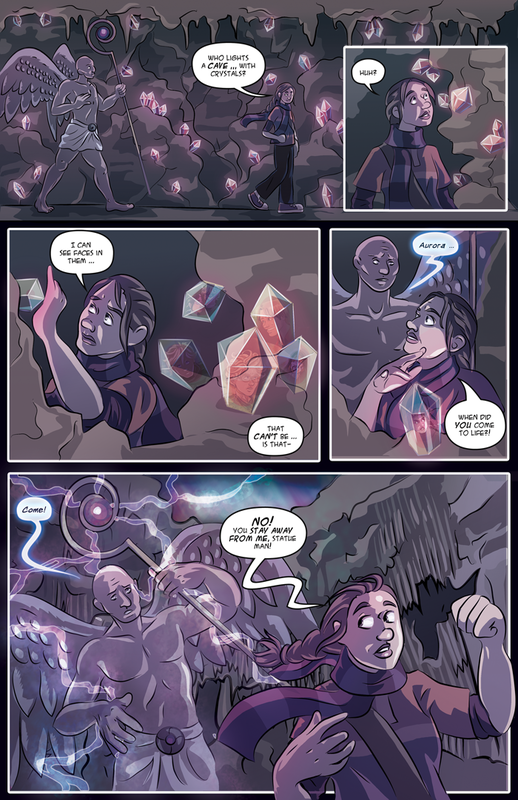 Rory is going the only way she can, through the passage, which has turned into a strange cave lit by crystals. The crystals have faces in them (yes there was some cheating with them, and they are from pieces around the gallery) and she thinks she spies ... but she'd cut off mid thought by the statue (really, Rory, you are surprised it came to life when you weren't looking?). Faces of the future, mayhap? And one familiar ... no no, won't say ... Spoilers. Play a little "I spy". The sad faced state/angel tries to get Rory to come (maybe he doesn't like the job he's been animated to do), but she's having none of it. Enter the first instance of me giggling behind my chair thinking "Run, Rory, run!" Hmm, and why can you see an aurora over the ledge of the cave ceiling?